The British media’s concentration on the recent traumatic and political events in the UK has meant that the almost microscopic attention devoted to the character of Donald Trump’s presidency has to some degree subsided. In the US though, the mutual antipathy that exists between Trump and the so called mainstream media continues unabated. These latest incidents are sadly in character and another example of the reputational damage Trump is regularly inflicting on the highest office in the free world. As I’ve written before, on Twitter Trump is behaving like the celebrity he is – cutting out the troublesome middleman to promote himself and his policies without the inconvenience of long-form explanation. These tweets are not as ill thought out as we may imagine. He clearly sees the value in bypassing the “crooked” mainstream media to speak directly to his base support in a language he thinks they understand. All through his political life he has lambasted the press and his tone and style is supposed to be so far away from conventional political discourse as to be thought refreshing and different. Can you imagine any other world leader being so coarsely offensive with such a frequency and flagrancy? But as distasteful as all this undoubtedly is, it was another incident last week which is potentially more serious for the media collectively. On Tuesday, Cable news giant CNN apologised for running a report on its website which alleged that a Russian bank linked to a close ally of President Trump was under Senate investigation. As soon as the report appeared there were concerns over its use of just one anonymous source and the fact that it had failed to go through the usual various checks and balances that are usually adhered too. CNN’s apology and withdrawal of the story is a move which may have long term significance for investigative journalism because the three people deemed to be responsible for the mistake have resigned their positions. These are senior, serious journalists – the writer of the report, Pulitzer nominee Thomas Frank, assistant managing Eric Lichtblau, himself a Pulitzer winner and Lex Haris, the executive editor in charge of investigations. 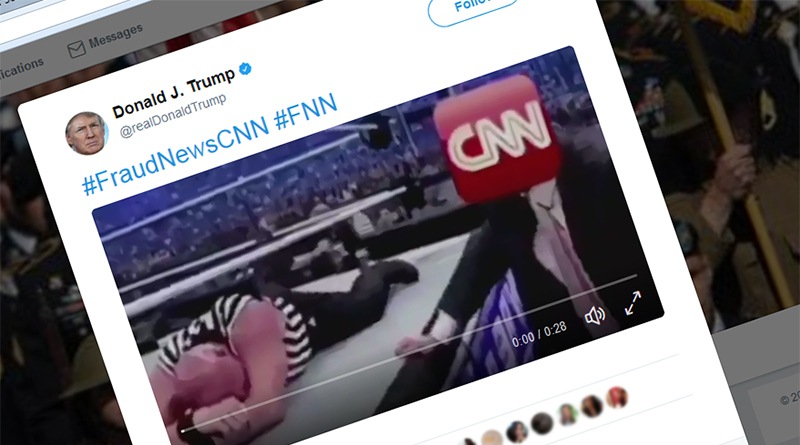 The swiftness of the apology, retraction and resignations is important; illustrating the atmosphere of heightened attack that CNN feels is the norm under Trump. It is apparent that mistakes were made, but there is no suggestion that there was any dishonesty involved – which makes the acceptance of the resignations deeply troubling. It appears that CNN senior management has bowed to the will of the President. But the fact is in the current climate, any reports even tangentially linked to the President must be rigorously examined for veracity in order to stave off the habitual charge of ‘fake news’. So they caught Fake News CNN cold, but what about NBC, CBS & ABC? What about the failing@nytimes & @washingtonpost? They are all Fake News! the public are often unable to distinguish online between well researched news and information from reliable sources, PR, propaganda, advertising, activism or simply gossip or innuendo. Trump is wilfully adding to the confusion with such inflammatory statements and a strategy of relentless attack. These can be seen as diversionary tactics, of course, which take the focus off his low ratings, troubled domestic programmes and an increasingly confused foreign policy. There is another element, too. Bret Stephens writes in the New York Times that the President’s “war on truth” is the act of a bully pushing down on a weaker adversary. This has some credence when one considers that, as Stephens reports, recent polls indicate just 24% of the US population has confidence in TV news and 27% in newspapers. Added to this, amongst Republicans there is just 14% confidence in TV news, and just 12 percent in newspapers. 60% though, have confidence in the presidency. But for how much longer? The Whitehouse appears to be mired in perpetual farce and if fake news is the “creation and sharing of information known to be false” then Trump himself has just been caught bang to rights. It’s been revealed that the globally renowned Time magazine has asked the President to remove a framed copy bearing his image from the halls of five of his golf clubs. The cover, which carries a portrait and the headline “Donald Trump: The ‘Apprentice’ is a television smash!” is dated March, 1st 2009. But, as the Washington Post, reports, it’s a complete fake. There was no March 1, 2009 issue of Time magazine. There was no issue at all in 2009 that had Trump on the cover. To borrow a well worn tabloid phrase – you couldn’t make it up.